When you’re starting your family there are many things you need to buy: a crib, clothes, changing table, diapers, toys…the list goes on and on. We know that it can be expensive, but there are some things you just need. A baby cam is one of those. Many parents look at baby cams as a luxury but they are so much more practical than people might think. 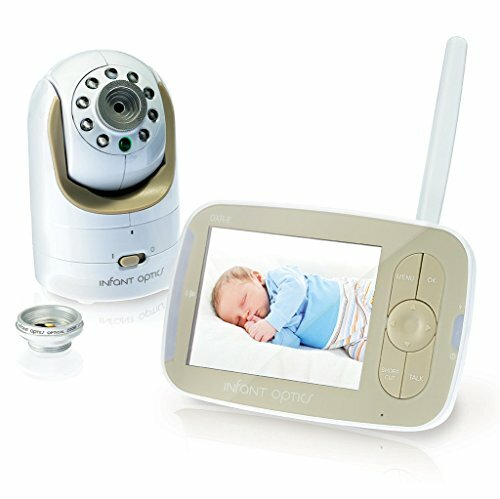 Read about the best baby cams below so you know which one can help you keep an eye on your little one, and if you’re not quite sure where to start, begin with what to look for in a baby monitor. This camera is used for other purposes besides baby monitoring, but that doesn’t mean it’s any less great. 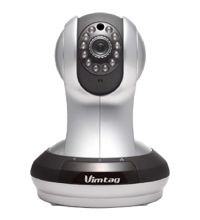 The Vimtag camera has great features and lets you view the footage via your smartphone while you’re away from home. You may love or hate this, depending on your concerns with security. 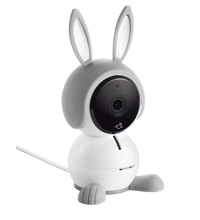 Once your child has grown up, this camera can be used as a security camera or a pet camera. We chose this as our #1 pick for this list due to its versatility, reasonable price point, and a number of features. 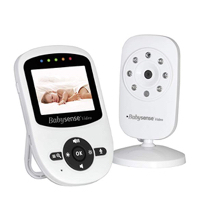 The Infant Optics DXR-8 baby monitor gives you many viewing options. 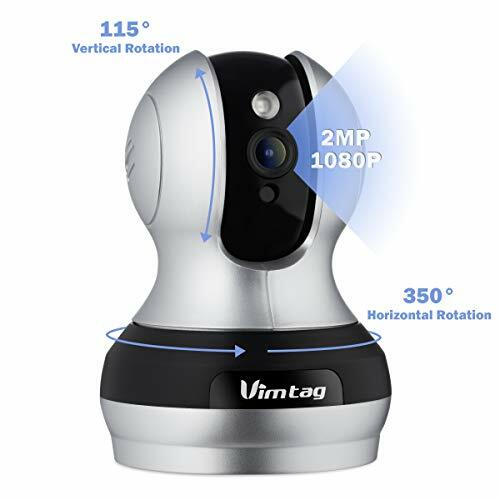 You can change the optical lens to your viewing angle and zoom; you can also pan, tilt, and zoom remotely so if your baby moves in her crib you can move the camera onto her as well. This plug-and-play baby monitor does not connect to your Internet, which is a good or bad thing depending on how you feel. If you’re looking for a wifi baby monitor that you can view on your smartphone, this isn’t the one for you. However, we love this because your chances of being hacked greatly decrease since it’s Internet-free. For these reasons, we have chosen it as our #2 pick for the best baby cam. The Arlo baby monitor is the cutest of the baby cameras on our list. 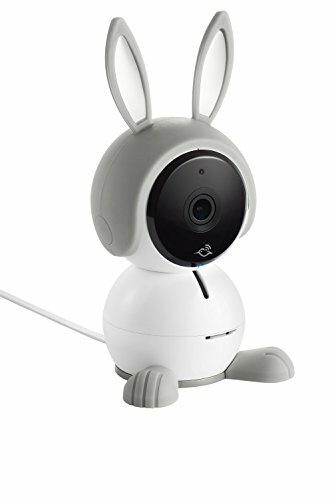 Adding to the suite of high-quality Arlo cameras, this baby cam stands out from the competition with tons of cool features. With the Arlo baby monitor, you can live stream your camera feed straight to your phone from wherever you are, get humidity and air quality updates, play lullabies and white noise, or even your own pre-recorded voice through the camera–a huge benefit for parents that want to sing their baby to sleep, even when they’re out on a date. If you’re looking for a high-tech, multi-use baby monitor, the Arlo is the way to go. Below are some other baby monitors we reviewed that didn’t make our top 3 list. However, they’re still great cameras so be sure to check them out. 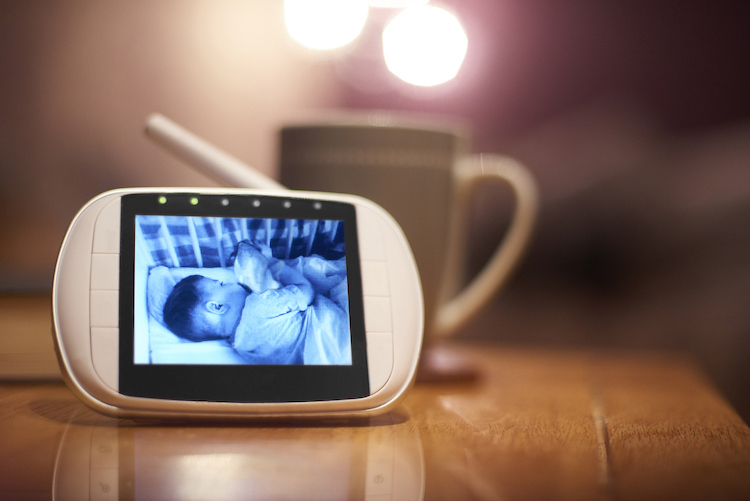 Babysense’s baby monitor crept up on our list because of its portability. 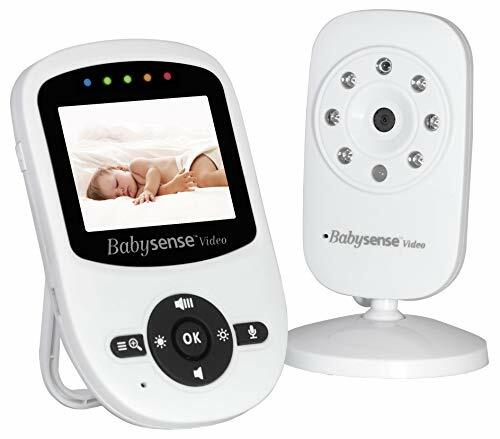 The Babysense looks and feels a bit “cheaper” than the competition, but it also comes in at a lower price point, without sacrificing things like night vision, two-way talk, and temperature monitoring. We love that the LCD monitor is so portable, for the parent that likes to stay busy while their baby is asleep, and with a 900-foot range, you never feel like any corner of your home or backyard is off limits. If you’re looking for a lower-priced baby monitor without sacrificing any of the tech of our top picks, this is the monitor for you. 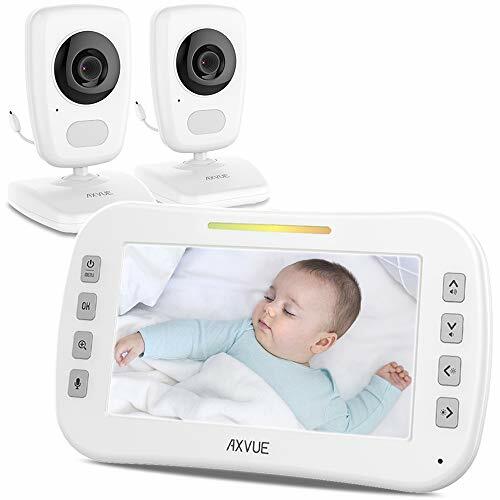 The AXVUE E632 baby monitor earned its spot on our list with its power-saving technology, voice activation capabilities, and its lower price-point: coming in around $110 for two cameras gives the competition a serious run for their money. 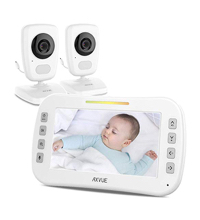 Without compromising any of the key features we like to look for in baby monitors, like two-way communication, night vision, and temperature detection, we love that this monitor gives you two for the price of one. While we wanted to opt for a lower priced monitor for the #6 position on our list, the VTech beat out its competitors by offering two higher quality cameras, a longer range than its competitors, and more expandable options (up to 4 cameras) for all situations. Two-way talk lets you soothe your baby from another room, and temperature monitoring will put you at ease, knowing that if your thermostat is back on the fritz, you’ll be notified before your baby becomes uncomfortable or unsafe. 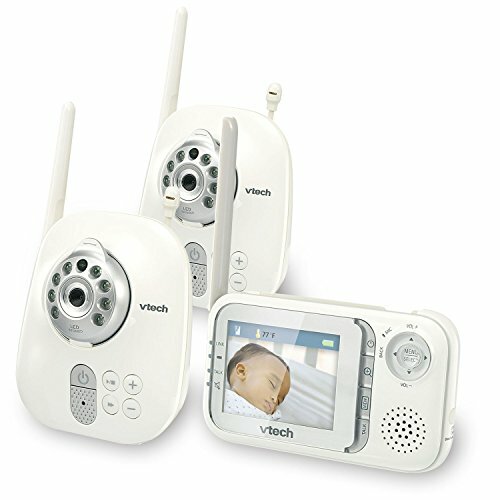 With lots of positive reviews, we were confident rounding out our list with the VTech baby monitor. There are some features you’ll want your baby monitor to do and others that you are indifferent about. Night vision, is it really that important? In our opinion, yes! You’ll be putting your baby to sleep at many times of the day and some of those times it will be dark out. If your camera doesn’t have night vision, you won’t be able to see your baby. So we think night vision is a must! Another thing to consider is remote access. 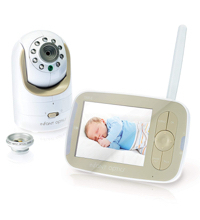 Do you want to have access to the baby cam footage while you’re away from the home? This is more of a personal preference. While some parents like this idea of this because they travel often or simply want to check in throughout the day others prefer not to have footage of their baby connected to the Internet 24/7. This is completely up to you. Two-way voice is another feature that we love but ultimately, is up to you as a parent. Two-way voice allows you to speak with your baby without physically being in the room. You can help calm your baby by talking to her or, depending if you have remote access, you can say goodnight to her even while you’re away from your home. The ability to pan, tilt and zoom remotely is another option to consider. In our opinion, this isn’t as important. Your baby will most likely be in her crib, therefore, there’s not much need to pan throughout the room. However, you may want this feature and that’s completely fine. We don’t find it to be as necessary, but as a parent, this is up to you! So should you get a baby cam? We recommend it. 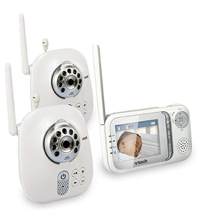 Baby cameras will give you peace of mind and allow you to check in on your child without having to risk waking them, and once your baby grows up, people often reuse them as pet cams or more traditional security cameras. Which camera is your top pick?